Out with the old, and in with the new – that should be your new motto for the coming year. Are you one of the 150 million people who have amalgam fillings? In that case, out with silver fillings and in with the white! By now, you know about the dangers of mercury. (If not, please refer to our previous blogs on this issue). Mercury is known to be the most poisonous non-radioactive substance, and more: there is no such thing as a "safe level" of mercury. Amalgam fillings, commonly referred to as silver fillings, contain mercury and its vapors are constantly being released in your body. Eventually, the mercury fillings in your teeth can poison your body’s cells and can eventually make it to your brain cells as well. 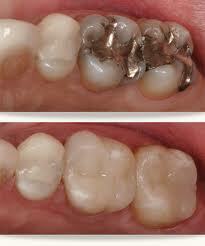 Simply put, amalgam fillings are not safe for you or your children. This issue has proved controversial over the years. While the ADA considers amalgam fillings to be safe, the World Health Organization considers that the level of mercury in your amalgam fillings releases more poisonous toxins than any collective amount you might ingest through food, water and air. In 2009, the FDA ruled that, while amalgam fillings were not safe for pregnant women or for children under six years old, they were still considered safe for adults. However, considering where amalgam fillings are placed and the proximity of their neurotoxins to the brain, there has been a growing campaign among dentists and toxicologists requesting that the FDA re-examine its findings. The main problem is that your body does not have a system for excreting mercury from your body. Thus, the mercury vapors released into your body will remain in your system for months and sometimes years. Considering that there are no declared safe levels of mercury, you are better off not having amalgam fillings in your mouth. The good news for you is that most dentists are beginning to understand the dangers of filling their patients' teeth with this poisonous material. About 50% of dentists in the US have adopted a mercury-free stance and are using safer and viable options like composite fillings, which are durable and, most importantly, non-poisonous. If you have amalgam fillings, or are considering having amalgam fillings, we advise you to do your research thoroughly. Call our office at 212-452-3344 and we will gladly give you more information. Also, pick up a copy of Dr. Tom McGuire’s The Poison in Your Teeth, and learn more about the subject.